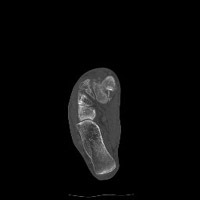 The Lisfranc fracture-dislocation is a term for the most common dislocation in the foot, consisting of dorsal dislocation of the tarsometatarsal joints. This entity is common in Charcot joints. 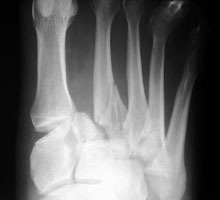 Homolateral dislocation consists of lateral dislocation of metatarsals one through five or two through five. 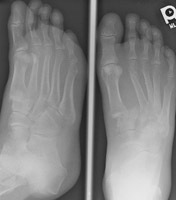 Divergent dislocation consists of lateral dislocation of metatarsals two through five and medial dislocation of metatarsal one. The injury is due to severe plantarflexion of the foot with folding of the midfoot upon the forefoot. This can be seen in parachute jumpers. A AP radiograph of the forefoot. There is homolateral Lisfranc fracture-dislocation. B AP and oblique radiographs of the foot. This is a different patient with a Lisfranc fracture-dislocation. C Axial CT. This image through the tarsal region. This shows associated fractures of the cuneiforms.